The treadmill offers a great toning workout. Elliptical machine and treadmill enthusiasts seem to be in a constant war to prove which machine is better. Of course, there's no one-size-fits-all answer to the debate; it all depends on your fitness goals. Muscle toning is a fitness goal that both the treadmill and the elliptical machine can help you achieve, although in different ways. Both the elliptical machine and the treadmill are primarily lower-body workout machines that will help tone the muscles of your legs, hips and glutes. To focus more on toning your quadriceps, hamstrings and hip flexors, the treadmill is the machine to choose. However, the elliptical still tones these muscles and might have the upper hand when working the calf and hamstring muscles, according to Mayo Clinic. That's because you can pedal backwards on the elliptical, which directly engages the lower part of your leg. Both machines also engage the abdominal and lower back muscles, although you will need to add abdominal work if you want to see a toned midsection — the machines alone won't do it. If you're looking to tone your upper-body muscles, the elliptical machine is the one to use. With a treadmill, the most you can hope to do is to swing your arms, which won't do much when it comes to toning. On the elliptical, however, you can use the upper body handles to move your arms along with the rest of the body. This will engage both the biceps and triceps, as well as the shoulder muscles. 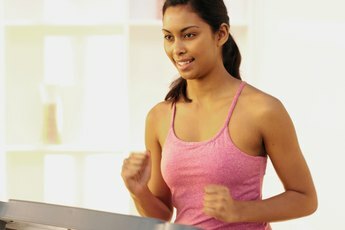 One way to make your treadmill toning workout feel tougher — and produce results faster — is to increase the intensity. Engage your lower body muscles, especially the quads and hamstrings, more by increasing the incline of the machine, which will simulate the effect of running uphill. According to a study published in the "Journal of Applied Physiology," uphill running engages the lower-body muscles significantly more than horizontal running. In the study, people running uphill also engaged the glute muscles more than those running on horizontal terrain. 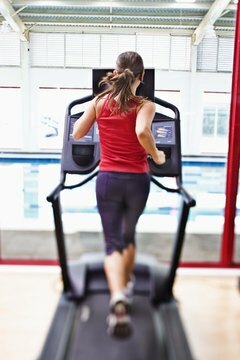 Although the elliptical does have an incline setting, it is not as beneficial to use it for toning goals as it is to increase the incline on a treadmill. The added incline on an elliptical will not do much to improve your muscle tone. To increase muscle toning benefits, increase the resistance setting on the elliptical instead. The harder it is to pedal, the more you'll engage your leg muscles — especially the quads and glutes — in the process.